The rattlesnake is one of the most common venomous snakes in the Americas. With 32 known species of rattlesnakes that range from as far north as Alberta, Canada to Central Argentina, a rattlesnake is a reptile that lives in a wide array of habitats. Because snakes live in such diverse climates and because of their sheer numbers, humans are bitten more often by rattlers than any other type of snake. In the United States, that means an average of 7,500 people become rattlesnake victims each year. 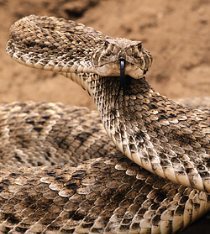 Rattlesnakes generally do not attempt to bite people on purpose unless provoked or surprised. In fact, rattlesnakes generally will retreat if they are aware of the presence of humans. 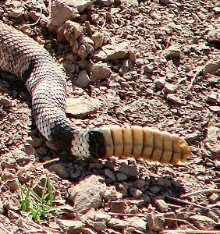 However, over half the rattlesnake bites that occur are to humans who were aware snakes lived in the areas they frequented, yet did nothing to avoid getting bit. The main reason a rattlesnake has a rattle at the end of its tail is to scare off predators. The rattle is composed of a series of hollow, interlocked segments made of keratin, which is the same substance that human nails and hair are mainly composed of. Snakes contract their tail muscles when startled or when they want to warn another creature to stay away, and that causes the segments to vibrate against each other and create a rattling sound. The muscles that cause the rattle to shake are strong and tireless, so snakes can keep up that sound for a very long time if needed. Different species of rattlesnakes have different size rattles and produce different sounds, but anyone who has heard an aggravated rattlesnake will agree that the sound closely resembles that of a baby's rattle, hence the name. The 3 Deadliest Snakes in the U.S.